Red riding hood Cha Cha, returns to the manga scene after 12 long years! Manga magazine Cookie will be publishing the freshest Akazukin Cha Cha manga on their August issue. The latest installment is called “Akazukin Cha Cha N”. Akazukin Cha Cha tells the story of Cha Cha, a young, magician-in-training. Although Cha Cha appears to have little talent in magic, her heart is in the right place. With the help of three magical items, two of which are kept by friends Riiya and Shiine, Cha Cha transforms into the Magical Princess Holy Up and with her powers, she fights evil. 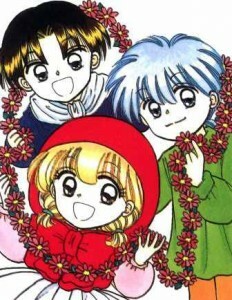 Akazukin Cha Cha first appeared in the pages of manga magazine Ribon thanks to Min Ayahana from 1991 until the year 2000 with a total of 13 volumes. In 1994, an anime version was made and although the story is different from the manga, it still gained a lot of fans. The anime lasted for over a year and had a total of 74 episodes. An OVA was also released in 1995 with a total of 3 episodes. The original Akazukin Cha Cha was set in a magical world where Cha Cha and the rest of her friends go to Urara Gakuen to study magic, which is quite analogous to Harry Potter going to Hogwarts. Akazukin Cha Cha N, however, is set in Tokyo. What adventures and misadventures will Cha Cha be in in the new manga? Find out on Cookie’s August issue! The August issue of Cookie will be in newsstands on June 26.